Business Service Management (BSM) is of growing importance in the IT world. By managing IT systems according to the business services they support - like order entry, online sales, shipping, or customer service - IT is able to deliver on real business goals like providing competitive advantage, improving customer satisfaction, driving revenue growth, and increasing shareholder value. 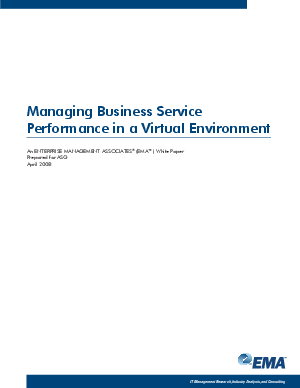 Virtualization is a rapidly growing technology that can help deliver these business goals. As well as providing productivity and cost benefits to IT, it can provide significant business benefits like greater agility, improved performance, high service availability, and better return on IT investments.